Our team at Street Advertising Services put together a countdown of the top 10 PR stunts that we have been raving on about in the office this week! Bulmers transported this Shoreditch bar back to the 1950’s by draining the bar and it’s contents of it’s colour, making you feel as though you’re watching your nan’s telly! A team of film set designers and make-up artists who have experience working on the popular box office smashes ‘Gladiator’ and ‘Avengers’, plus the popular cult TV series ‘Game of Thrones’ worked tirelessly to turn everyone black and white. This striking effect was to honour the new addition to the Bulmers family, the Zesty Blood Orange flavour. 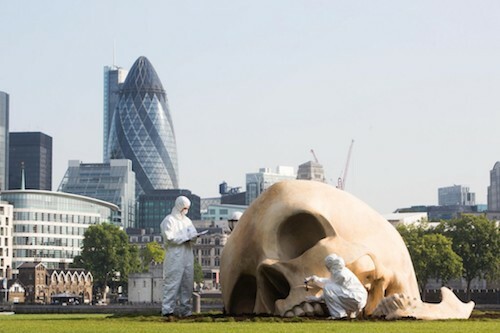 A 2.5m tall model of a human skull appeared on London’s South Bank as part of a ‘magnified crime scene’ stunt. No we haven’t discovered evidence of ancient giants in the nation’s capital, this large scale stunt was merely to celebrate the start of the summer season of crime dramas on television channel Alibi. Ant-Man…he’s a pretty small super hero…and like Ant-Man this promotional stunt is tiny yet packs a punch! 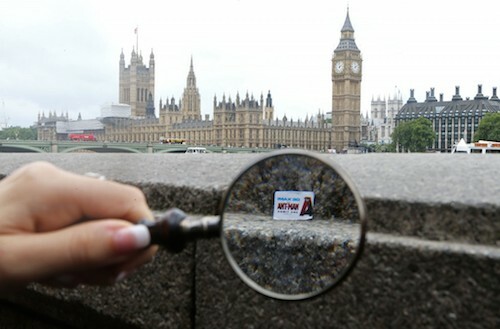 One day before the release of the new Ant-Man movie,100 ant-sized IMAX tickets were hidden around three UK cities – London, Manchester and Birmingham and if you were lucky enough to find one you would win a pair of tickets to the show…in a regular human sized cinema. The UK has had Wimbledon fever this month and although i’m sure the port-a-loo’s at the tennis event are in no way as bad as in the various festivals around the UK, they are smelly all the same! Well apart from this port-a-loo brought to you by Bath Store. This Wimbledon themed loo brings you all the best things from the event while you’re spending a penny! It has an AstroTurf interior, tennis memorabilia and a radio streaming match commentary, and most importantly the toilet is scented with a strawberries and cream! Do you like hamburgers? Well i’m sure you don’t like them as much ad these people do! So fanatical about hamburgers they got the popular fast food snack tattooed on their bodies. Burger King visited the 5 burger fans in their home countries of USA, Italy, Spain, Brazil and Taiwan and whisked them away to Sao Paulo in Brasil for a very special burger tasting session! The group were met by Miami Ink tattoo artist Ami James who gave their tattoos a ‘flame grilled’ upgrade. This year Wimbledon employed the ‘best ball boys in the world’…they are slightly hairier than last years bunch but not lacking in enthusiasm! Every fisherman has a story about ‘the one that got away’…in this campaign by the Australian government you have even more of a reason to step up your angler game. In a competition titled ‘The Million Dollar Fish’, 75 barramundis (that’s a type of fish!) were tagged with cash prizes and released into different fishing location across the Northern Territory. This stunt was to get more people out there fishing in the low season, to increase local tourism revenue and raise awareness of the state as a fishing destination. Last month saw the sad departure of footballing legend Steven Gerrard from his long term football club Liverpool FC. To capture the thoughts and feelings of a nation a bespoke message wall was created as tribute to the Liverpool legend. Thousands of well wishers tweeted in their messages of support to the hashtag #ThankStevieG. Messages starting rolling in from not only the UK but all over the world and they were live painted onto a canvas by an artist. The messages when observed from a distance revealed one of Stevie G’s most famous celebratory moments. Nivea has created the Nivea Doll which is an interactive and fun way to teach children the importance of spending a few minutes to apply sunscreen before they are allowed to go out and play. The doll when put in the sun turns bright red just like a child would if they got sun burnt. The photosensitive technology means that if the child applies sunscreen to the doll it’s skin returns to the it’s normal shade. This is a cute way to send an important message to kids about sun protection. More than 30% of drivers in Russia are happy to park in a disabled bay without taking a second thought, Dislife, a Russian non-profit organisation decided to give them something to think about. With technology that can scan the vehicle to see if it has a disabled parking badge they were able to separate the genuine from the inconsiderate. When a non-disabled driver tried to park in the disabled spot a hologram of a disabled person would pop up and and give the driver a good talking to! So there you have it! The top 10 PR stunts that have been exciting us this week! If you want to create your own PR stunt then get in touch now and we can get the ball rolling for your brand!